Last weekend, we began our Sunday as usual, not knowing what the day would hold. The kids had Sunday school here at GSF in the morning. Then we all loaded up to drive to church. We are close enough to walk, but in recent months we have been driving in order to make it possible for a Jaja (grandmother) to attend. This week we also drove 2 of our GSF kids who are not able to walk very well. Usually these two just go to Sunday school at GSF and have a worship time with the toddlers here. Again I was so thankful for the vehicle God provided which has made it possible for 3 people to attend church who otherwise would not be able. On our way to church I stopped to express my sympathy to the family whose son died a couple weeks ago. The father had also passed away on Saturday. When I was talking with them, they told me that the burial would be at 3:00 that afternoon. 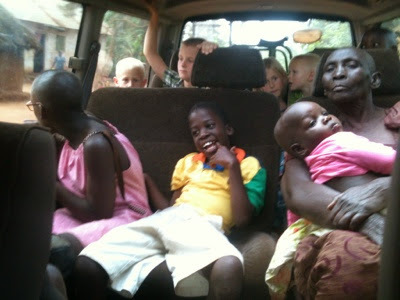 On our way home from church, several of the Jaja's grandchildren hopped in the van with us too. I think many of these kids haven't ever ridden in a "motorcar" before. Here is a photo of some of our passengers that day. On Sundays after church we usually have the Iyas and the Foxes over for lunch. Our church usually gets out around 1pm, and both of those couples live at a place where they cook over a charcoal stove. If they drove back to their village in Nyenga and then began their charcoal, they probably wouldn't eat lunch until after 3pm. We really look forward to these Sunday afternoons sharing a meal and spending time together. I wanted to attend the burial that afternoon, so I left soon after lunch to walk to the home in the village. I arrived a bit late and as I was walking up I heard the wailing. As I arrived at the home, I saw some men carrying a woman whose body was completely limp. I found out that it was the daughter of the man whose body was being burried. When I asked about what was happening, I received several different answers. One person said it was shock. Another told me that it was a problem with her pressure. Several others told me that the demons were entering the daughter. I didn't know what to think, so I just prayed for the family. After some time and other bizarre events, the daughter came back to consciousness and was escorted into a house. Please pray with us for this family who have lost a young man and his father in just a few weeks time. Peter is the name of the young man who is working to build our house, and now has to care for both his mother and sister. While I was sitting there visiting with some other friends from Buundo, one family let me hold their precious little baby boy who is just a few months old. He was so precious. It was so good to see a healthy baby boy in the village living with both his father and mother receiving sufficient nutrition. I can't tell you how rare this is. While I was holding this sweet baby, some of the women who were sitting with me told me in Luganda that I should feed the baby. I thought I must be misunderstanding and replied that I can take the baby to the mother if he needs to eat. They made it clear through words and hand signals that they meant that I should nurse the baby. I wondered if they were teasing me or if they were serious, but either way, I explained that I don't have any milk. Soon afterward, another woman I had met that day asked if she could go home with me. I could tell she was joking around. By the time I was leaving I realized how much I still have to learn about life here. Although I often don't know what to do or how to best communicate, I am thankful that I have a loving Father in heaven who is directing my steps through His Spirit. I am learning what it means to "pray without ceasing," as I see that I need Him every minute.